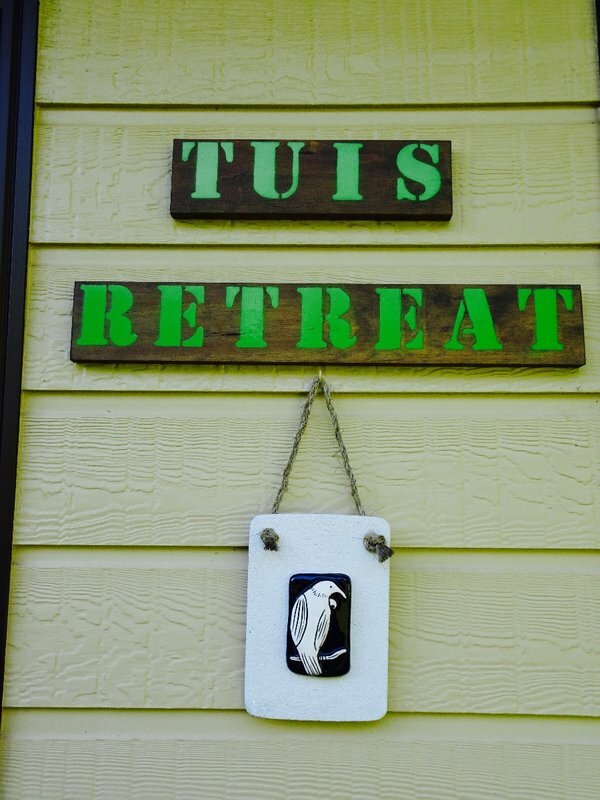 It is probably no small coincidence that one of my favorite places to stay in NZ was at a location with "Tui" in it's name. In Whangerei, we stayed out in the country; the cute little cottage was named Tuis Retreat. I have driven Greg crazy ( more than usual) by trying to get a good picture of a tui. The tui is my favorite NZ bird; they are beautiful, intelligent and I love to hear their amazing repertoire of "junk" sounds. The tui is a member of the honeyeater family; this means that it especially likes the nectar of certain kinds of flowers. 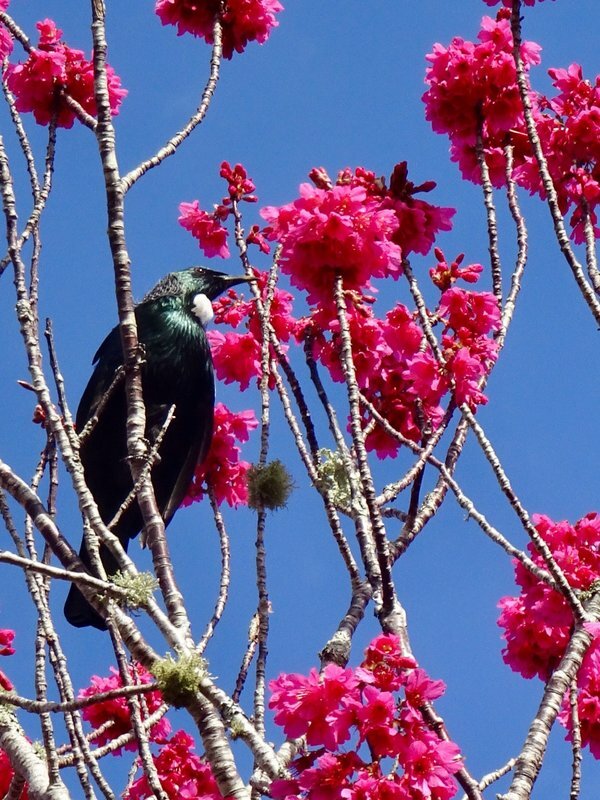 Flax nectar is one of it's favorites, but a tui may also follow seasonal flowers and fruit around the islands. It has two voice boxes; this allows it to make such varied vocalizations. 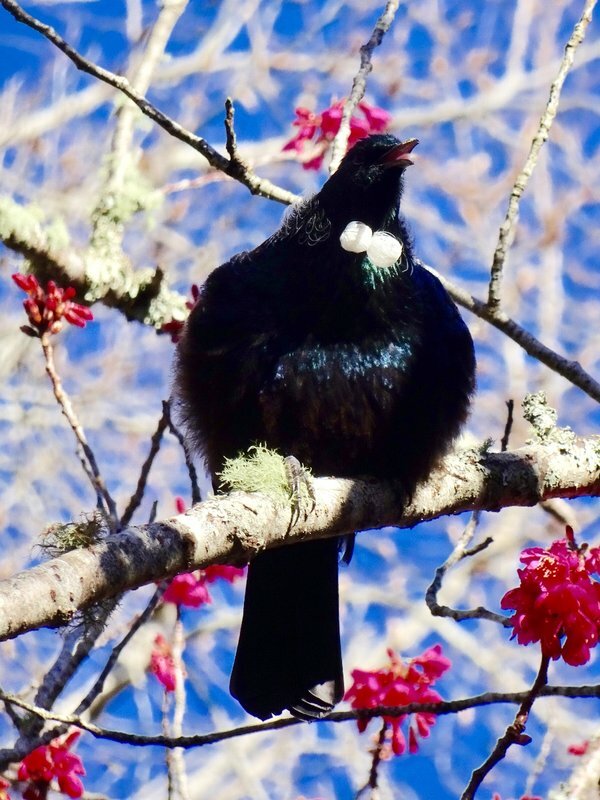 A tui does sing songs, but it also likes to copy other birds, humans, and animals, and then for good measure, they throw in all these grunts, coughs, wheezes, and just about any other sound you can imagine. From a distance, the tui looks all black with a little white at the neck. Depending on the light, they are actually blue, green, and bronze; they have 2 white curls of feathers at the neck. Nectar is a tui favorite; this is a common pose for getting that nectar. A tui will fluff out it's feathers to try to look bigger and more intimidating. 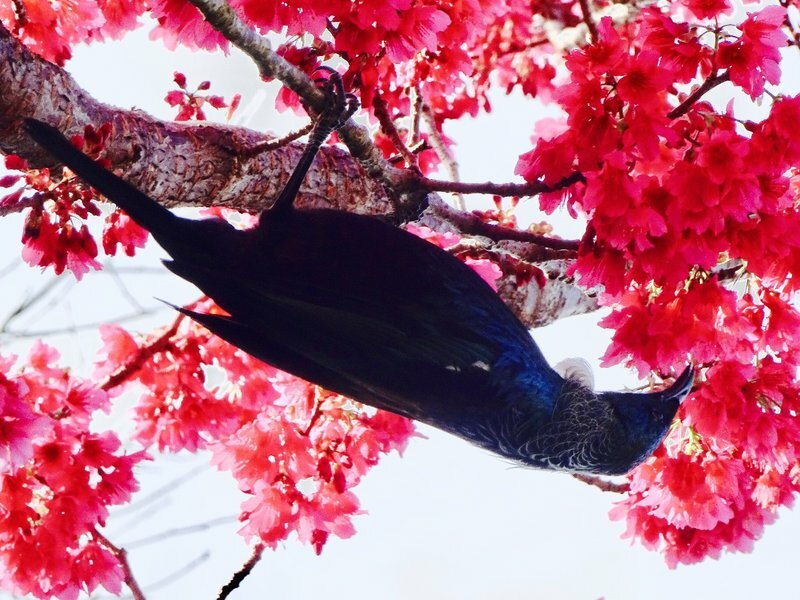 While this tui hadn't reached a full "fluff," it was busy making all kinds of warning noises. 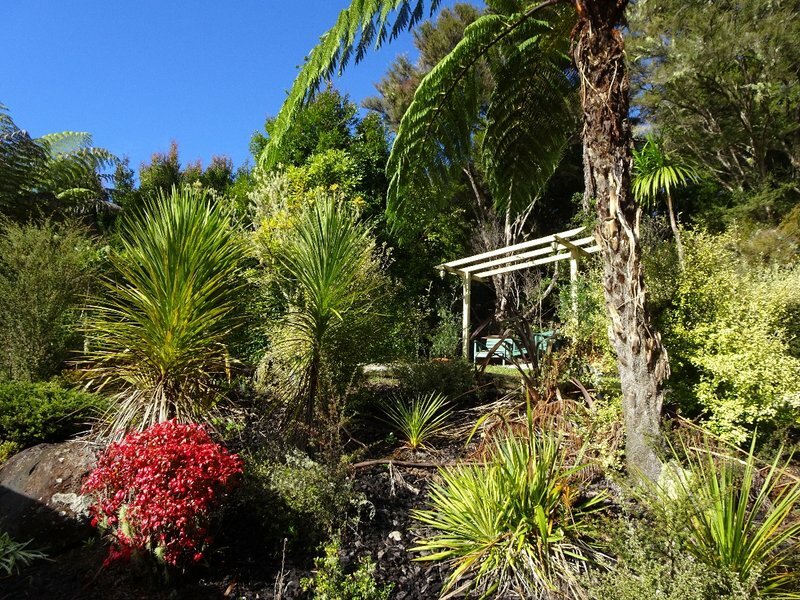 The grounds around the Tuis Retreat were filled with plants, flowers, and fruit trees. We saw it in the winter; I can imagine how nice it must be in the other seasons. 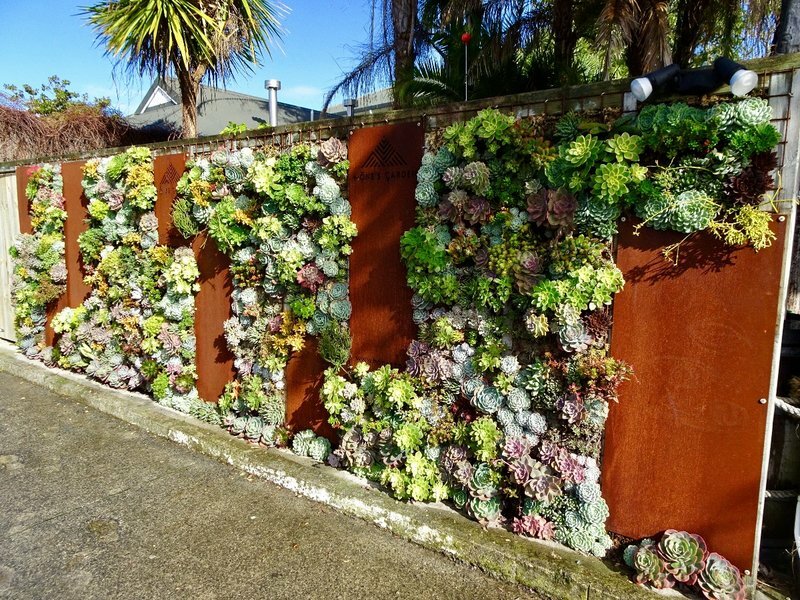 Whangarei is the biggest city in the Northland Region (basically, anything north of Auckland) of the the North Island; at around 56,000, it is the only place large enough to be considered a city. 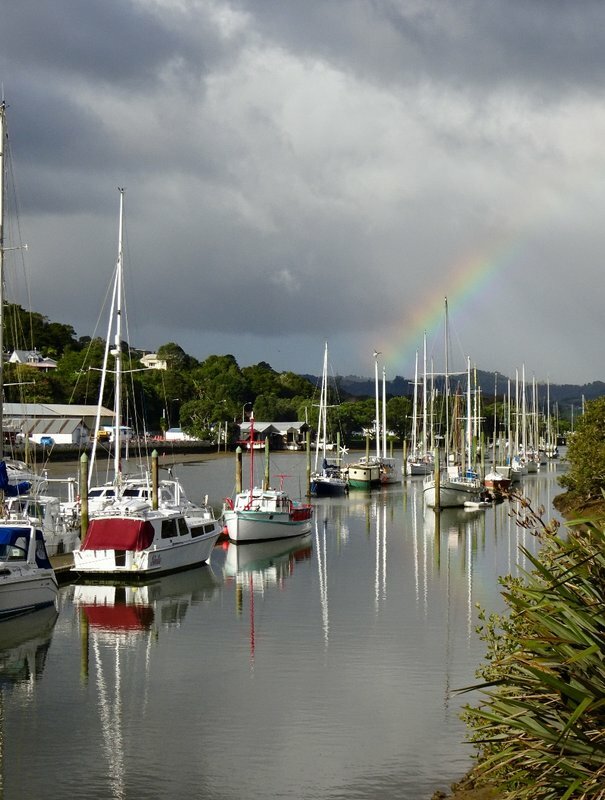 The Whangarei Harbor is known for yachting, and the "town basin" is the name given to the yachting marina and its surrounding restaurants, shops and museums. The walkway around the town basin is called the Hātea Loop. 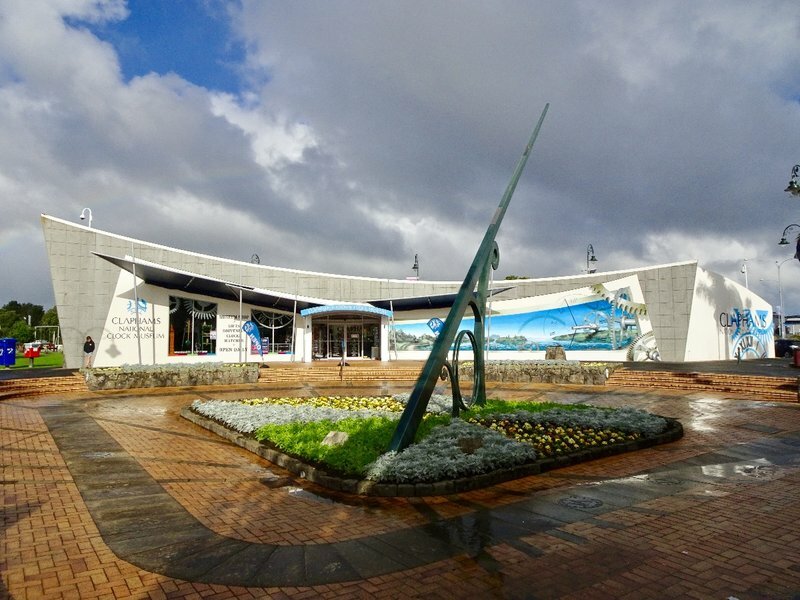 On the way to Bream Bay and the Tasman Sea, the Hātea River runs through the center of the town basin.. The Clapham National Clock Museum claims to have the largest collection of timepieces in the Southern Hemisphere. 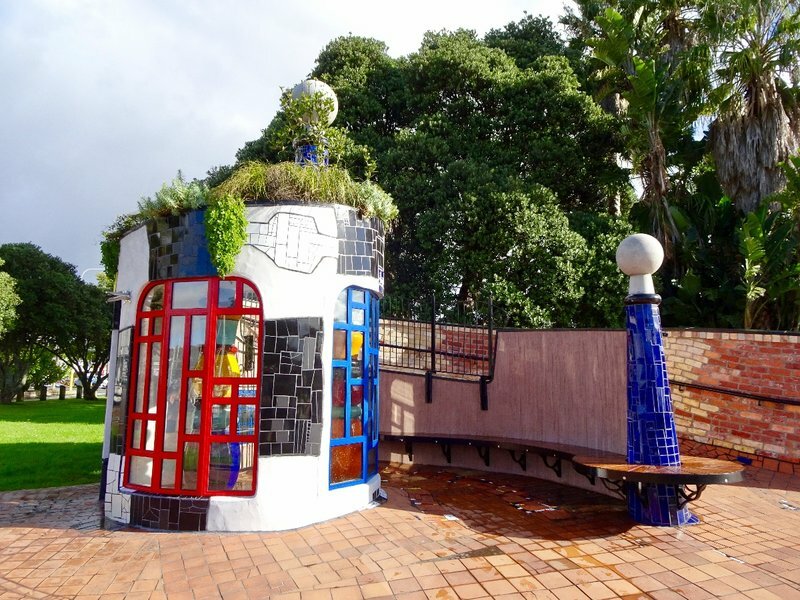 Te Kakano is the "seed" of the Hundertwasser Art Center and Wairau Maouri Art Gallery project. This "seed" sculpture was built so that the forms and finishes they plan to use on the Hundertwasser Art Center, could be tried out on a smaller scale. It will be the only Hundertwasser Art Center in the Southern Hemisphere; since the original opened in Vienna, there are 30 art centers in the world. 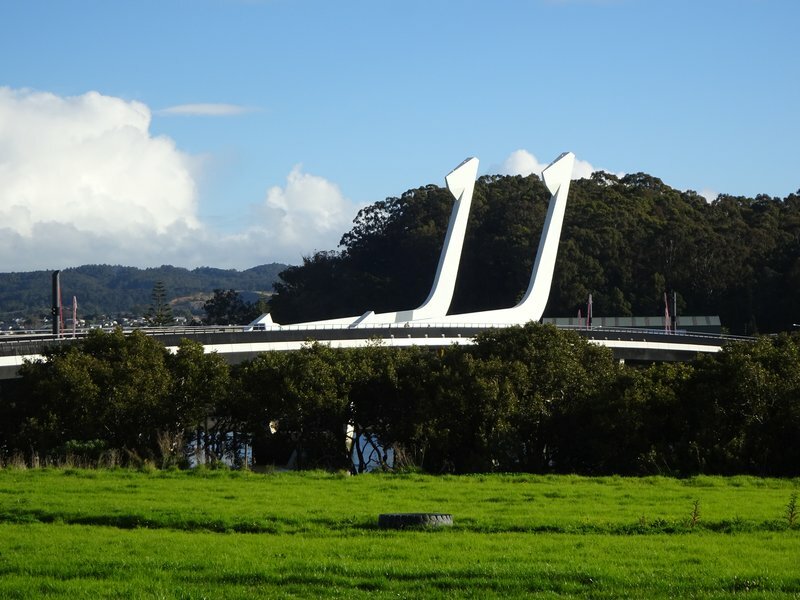 The official name of this bridge is the Matau ā Pohe Bridge, meaning "The Fish Hook of Pohe." 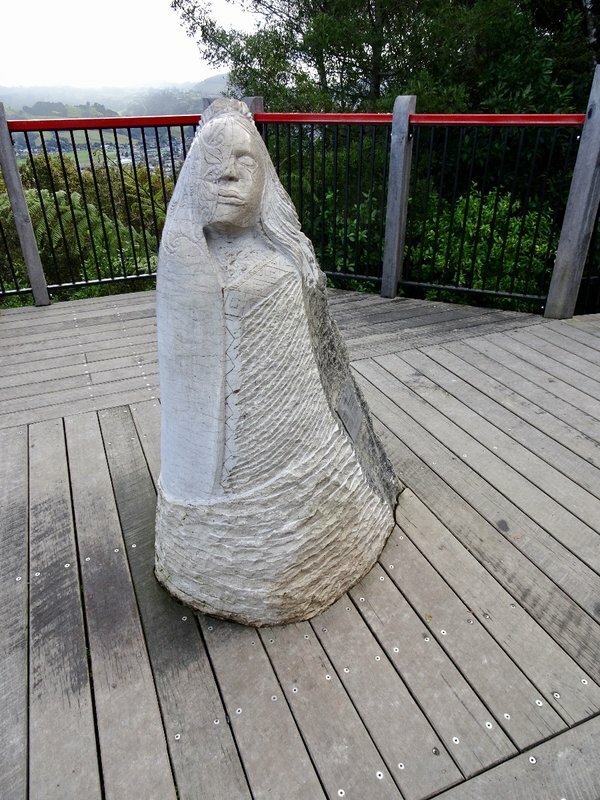 Pohe was the Māori chief who greeted the first Europeans to ever visit this area. A center section of the bridge lifts up to accommodate boat traffic on the Hātea River. This kōhatu (stone) carving anchors the Mt. Parihaka lookout. One of NZ's largest Māori Pā (fortified villages) was located on this mountain. 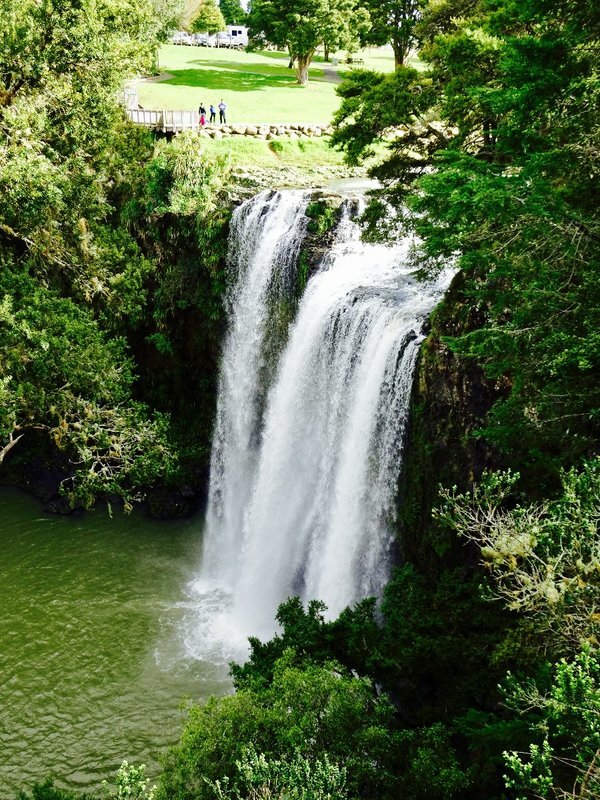 Whangarei Falls sits a few miles above the town basin. At night, when it was quiet, we could hear the falls from our Tui Retreat. We walked to Whangarei Falls by way of the AH Reed Kauri Walkway. 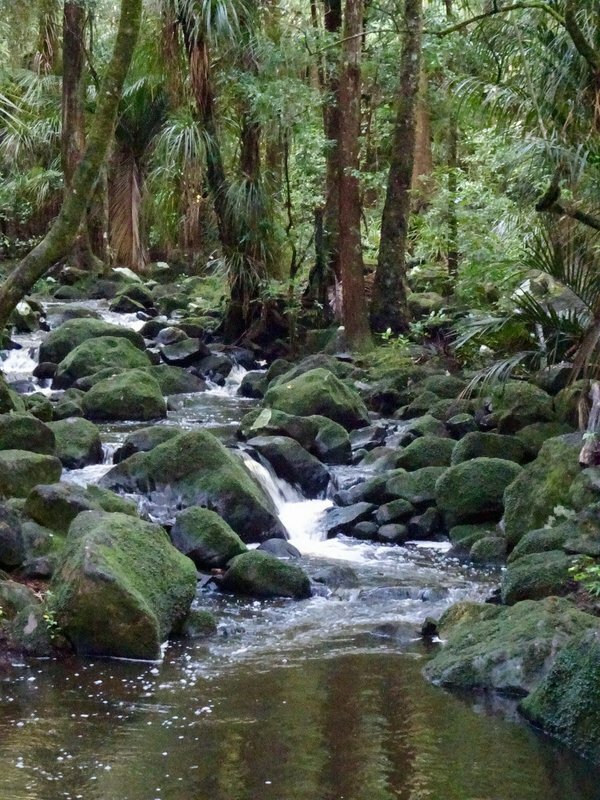 After going through a small kauri forest, the walk folllowed the Hātea River to the falls. One day we made the 25 mile drive to Whangarei Heads; it sits at the head of the large Whangarei Harbor. 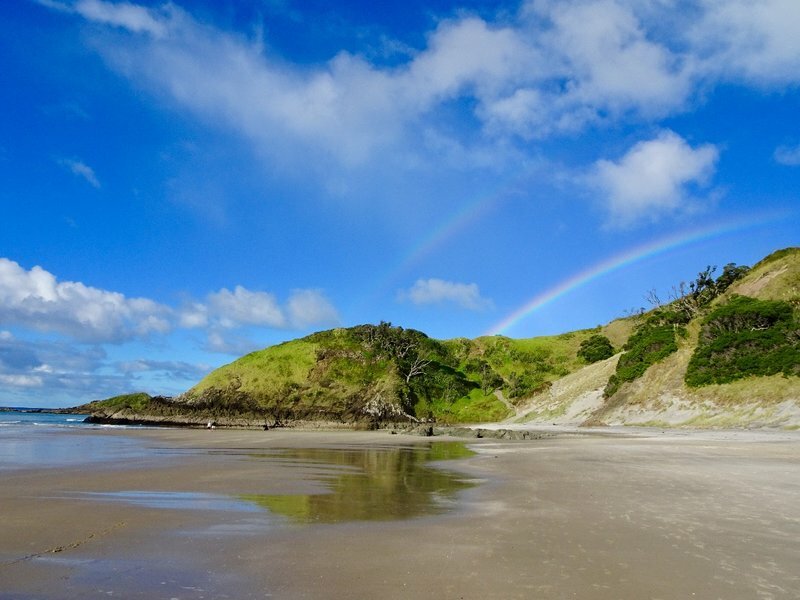 At the end of Whangarei Heads, lies the 3 mile long Ocean Beach and on this day, a couple of rainbows. We passed by Mount Manaia on our way to Ocean Beach. 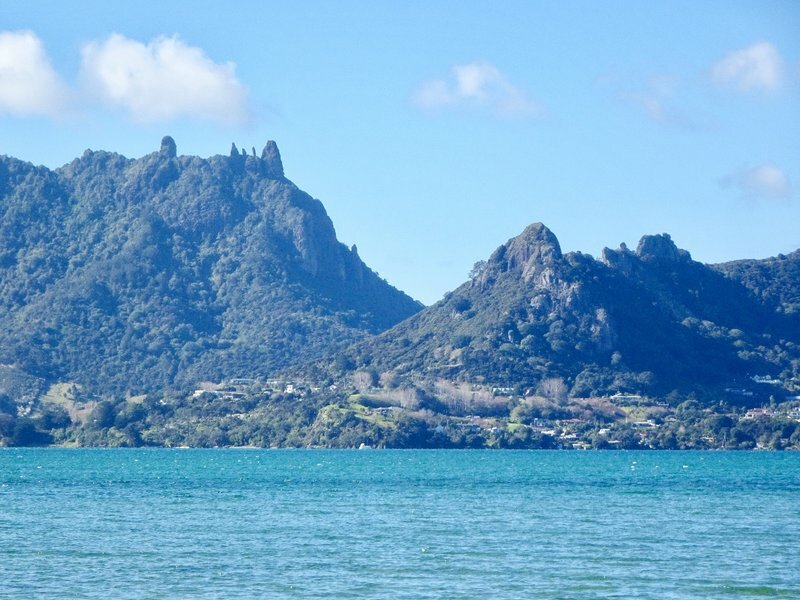 By Maori legend, the five rocky outcrops on Mount Manaia, are people who were struck by lightening and turned to stone. Mount Manaia is actually one of several remnants of volcanic action that overlook the Whangarei Harbor. 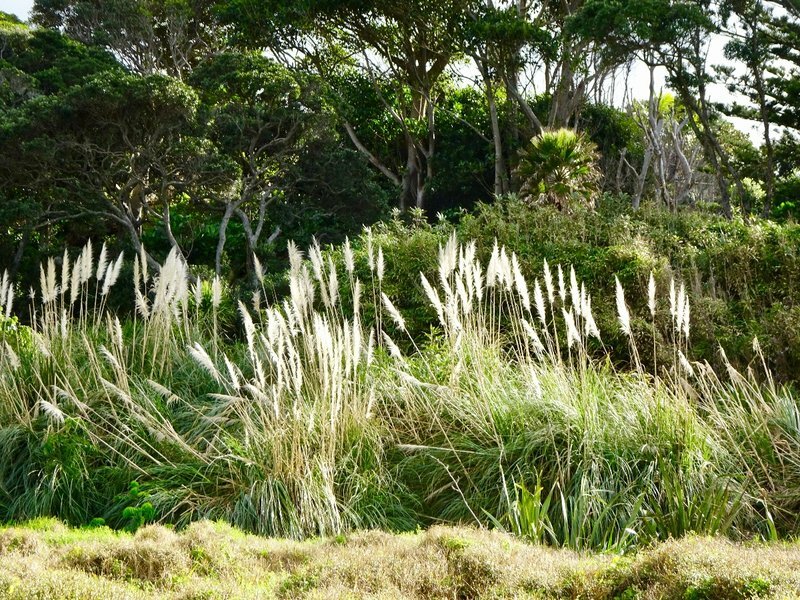 Toetoe grass is common all over NZ. 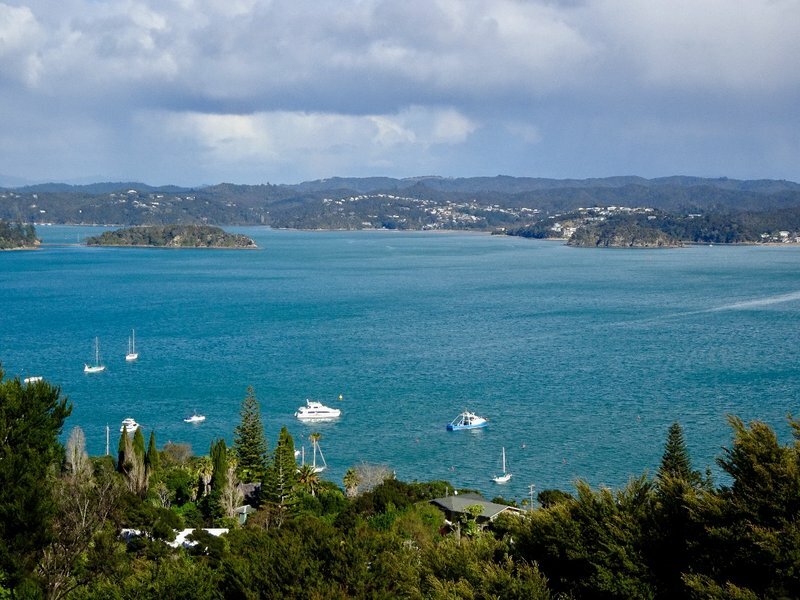 The Bay of Islands consists of a large harbor that contains 144 islands and numerous inlets and peninsulas. Some of the islands are lived on, some are farmed, and some are reserves.The area was named by James Cook when he visited in 1769. Fishing in the Bay of Islands, was made famous by the author Zane Grey, in 1926; in addition to being a western author, he was also an avid fisherman. He wrote a book about the uniqueness of NZ's game-fishing. The Bay of Island's smallest and perhaps most infamous town is Russell. 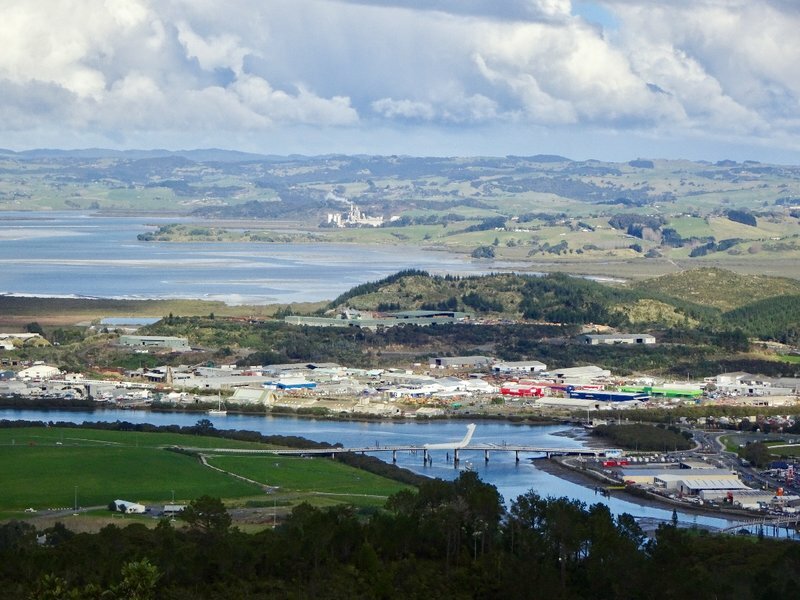 It was once known as the "Hell Hole of the Pacific" in it's whaling days, but it was also NZ's first seaport, it's first European settlement and it's first capital. We walked around this historic town, and we also visited Flagstaff Hill. Flagstaff Hill had 4 flagstaffs chopped down by the local Maori, in protest of British rule, before the current one was erected in 1858. 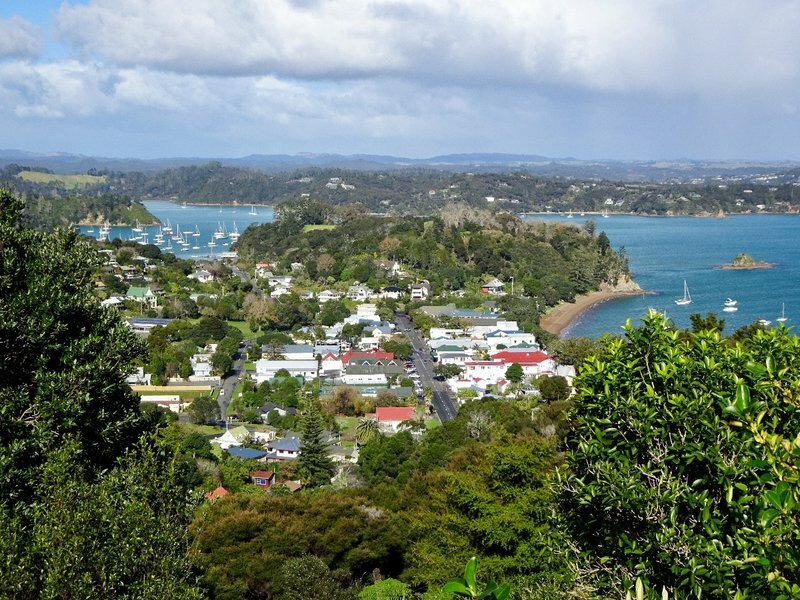 The lookout here provides great views of the Bay of Islands. This view is from Flagstaff Hill; it looks out on a small part of the Bay of Islands. This view from Flagstaff Hill looks over Russell and across the the Bay of Islands toward Paihia. 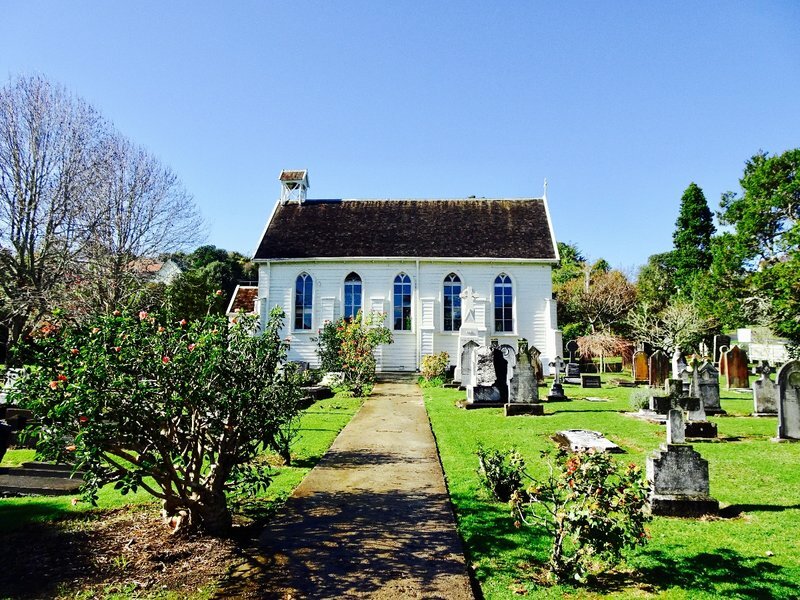 Christ Church is the the oldest existing church in NZ. The Maori and Europeans had equal rights of burial, thus it has so many significant settlers, sea captains, missionaries, and Maori leaders buried here. 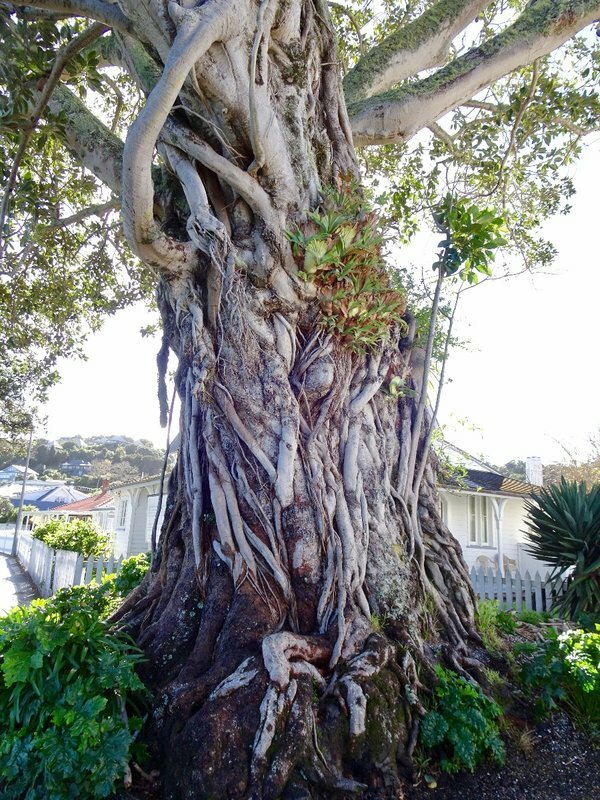 This Morton Bay Fig tree was planted by a customs keeper sometime between 1870 and 1886. 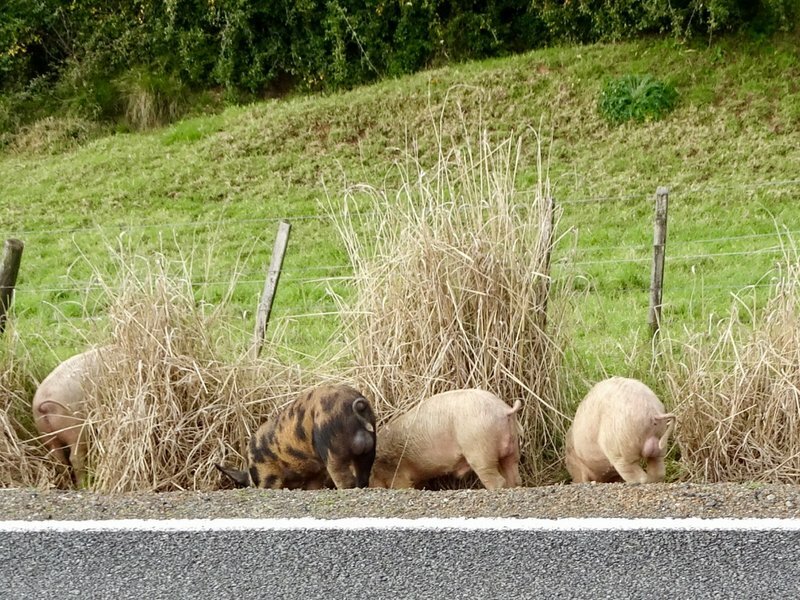 I included this photo because we have seen a lot of things along the road ( especially in AU), but this was our first encounter with pigs roaming wild.